Hardwood Platform Trucks offer multiple handle and caster options. Safely transport product, and minimize lifting and carrying! Akro-Mils products save time and money by helping to increase material handling efficiency in virtually any industry. Our broad range of storage, organization and transport products are used to shorten assembly times, maintain accurate inventories, optimize storage space and improve parts protection. Our mission at Akro-Mils is a commitment to manufacturing innovative storage and material handling products of uncompromising quality at a fair price. We support this commitment with professional representation and consistent, superior service to meet the needs of our customers. for quality products backed by more than 60 years of reliable delivery and responsive customer service, we invite you to turn to the Akro-Mils advantage. 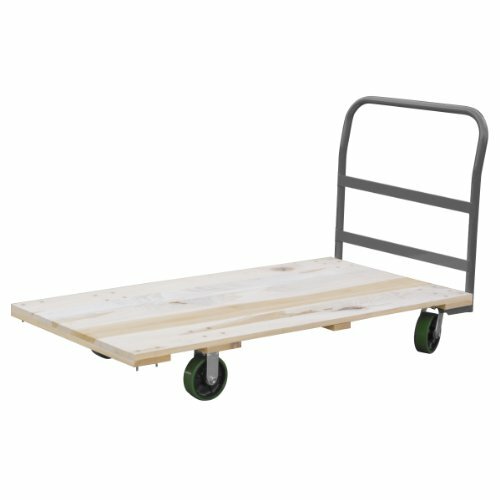 Lakeside 322 Traditional Duty Utility Cart, 3 Shelves, Stainless Steel, 300 lb Capacity, 18-3/8" x 30-3/4" x 33"